Innocent child's tale, or meditation on the afterlife? Miyazaki Hayao is the Lord of Animation, one who has had as wide a cultural impact as Walt Disney himself. His movies feature strong male and female characters, interesting storylines, stunning visuals, and fascinating technologies in ways unrivaled by any other modern animator. But that does not mean that all of his movies are created equal. Miyazaki has made the finest animated works of all time in My Neighbor Totoro and Spirited Away. On the other hand, he’s made some comparative duds (like Howl’s Moving Castle or The Wind Rises, both of which are not bad movies by any stretch of the imagination). I have already talked about some of my favorite Miyazaki movies on Nerds of a Feather. 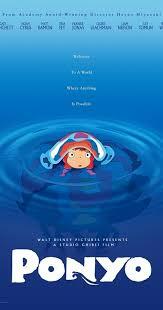 Today, I’d like to introduce the movie I am more conflicted about: Ponyo. WARNING: The following discussion is spoilerific! Ponyo tells an innocent love story between a fish-girl, Ponyo (or “Brunhilde” as her father refers to her), and a five-year-old boy, Sōsuke. Sōsuke finds Ponyo trapped in a glass jar on a beach. He frees her from the jar, only to cut himself in the process. In thanks, Ponyo licks his hand, healing his wound and initiating changes that allow her to transform into human shape. Thus begins a friendship, or a pure love story as told through the eyes of a child. 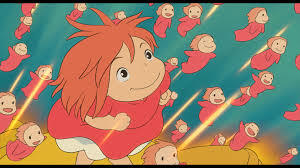 Ponyo decides that she wants to become human, and the rest of the movie revolves around the adventures she takes with Sōsuke to make her wish a reality. "The film opens with a spellbinding, wordless sequence beneath the sea, showing floating jellyfish and scampering bottom-dwellers. 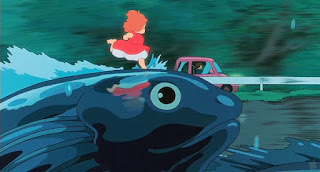 The pastels of this scene make Ponyo one of the very rare movies where I want to sit in the front row, to drown in it. This is more than 'artistry.' It is art." Still, in all honesty, I did not like Ponyo much the first time I saw it. The storyline appeared somewhat childish, the narrative and dialogue left important questions unanswered, and the characters acted in head-scratchingly strange ways. Take Sōsuke’s mother. She’s the epitome of a strong woman, one who has little problems taking care of herself, her family, and the community while her husband is away at sea. But whether driving through a tsunami or leaving her five-year-old son at home alone for no apparent reason, she continually chooses to put herself and her child at risk. Every driving scene is particularly cringe-worthy. But having a two-year old at home gave me the chance for a second take… then a third… and a fourth… and a fifth… I’m now at least thirty times in. Watching a movie this many times (granted, my attention now wanders more than I care to admit) has given me a different take. I now see quite clearly that Ponyo is much more nuanced and creative than I had originally thought. In addition to being a cute story that is safe for children, it seems likely that Ponyo is Miyazaki’s subtle and veiled meditation on death as he advanced in age. Take Ponyo's given name, Brunhilde. Some have suggested that Ponyo is a deliberate incantation of the valkyrie Brynhildr, someone who served in some Germanic myths as a harbinger of death. Ponyo herself serves in a similar capacity, bringing a tsunami that wipes out the majority of Sōsuke's village, even reaching the lighthouse where Sōsuke resides. In the wake of that tsunami, Ponyo and Sōsuke may in fact bear witness the passing souls of the now-decimated community. As the two adventurers ride in a toy boat in search of Sōsuke's mother, they run into the whole town in small boats paddling toward the hotel on "the other side." Was this not a reference to crossing the Sanzu River, the Buddhist equivalent to the River Styx? 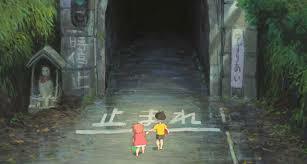 Moreover, later in the film, Ponyo and Sōsuke approach a tunnel that Ponyo obviously does not want to enter. Going into it causes her to revert to her fish form and to fall asleep. Was this tunnel one that leads to the afterlife? Finally some of the people they meet on the other side act in ways that suggest they might no longer be alive (the grannies, for instance!). Bonuses: +2 for the meticulous, hand-drawn artistry, which remains so much better than the current trend toward CGI. Penalties: -1 for leaving so many questions unanswered; -1 for Sōsuke's mom and her death wish. Multiple Views Bonus: +1 for making me think so much more deeply about this film than I had ever intended.